Modern Penarth was a creation of the Windsor estate, which laid out the new Victorian town in association with the dock and railway system that was opened in 1865. Thirty years later, the same estate would play a key role in the creation of Barry Docks, another port built to exploit the coal trade and break the Bute family’s control of exports from south-east Wales. The new Penarth was built in local stone and local brick. The building stone was a blueish carboniferous limestone that can be seen in the cliff-scape between Penarth and Sully. The bricks – red, yellow and blue – came from the nearby Cogan brick works, close by the railway line from Cardiff. Two forms of street layout were adopted, imposed on the land around Penarth Head, where the medieval parish church was superceded by Butterfield’s magnificent St Augustine’s of 1866. A grid of terraced streets anchored to Windsor Road, Queen’s Road and Plassey Street, provided working class housing. To the south, with a boundary between the two forms of development at Albert Road, was placed a greener townscape of detached and semi-detached villas for a growing class of professional and business households. Windsor Road was intended as a residential street as well, but instead evolved as a shopping street — a change presumably triggered by proximity to the town station of 1878. The Windsor estate had intended the commercial focus to lie at the junction of High Street and Queen’s Road, above the dock, but convenience and fashion seem to have dictated otherwise. Both zones were originally included in the extensive Penarth Conservation Area. However, the terraced grid was removed from the conservation area following a review in 1996. From a population just shy of 2,000 in 1861, Penarth grew to a town of 15,000 people on the eve of the Great War. Its dock was eclipsed in the 1890s by Barry, but remained was derelict by the 1960s. But late Victorian times saw the development of a polite seaside report, crowned by the Pier of 1895. Despite the spatial segregation of classes in the town, it is noteworthy how the use of a similar palette of materials, irrespective of the size of individual houses, shapes a unity of place that underpins the distinctive character of the town as it developed in the late 19th-century. 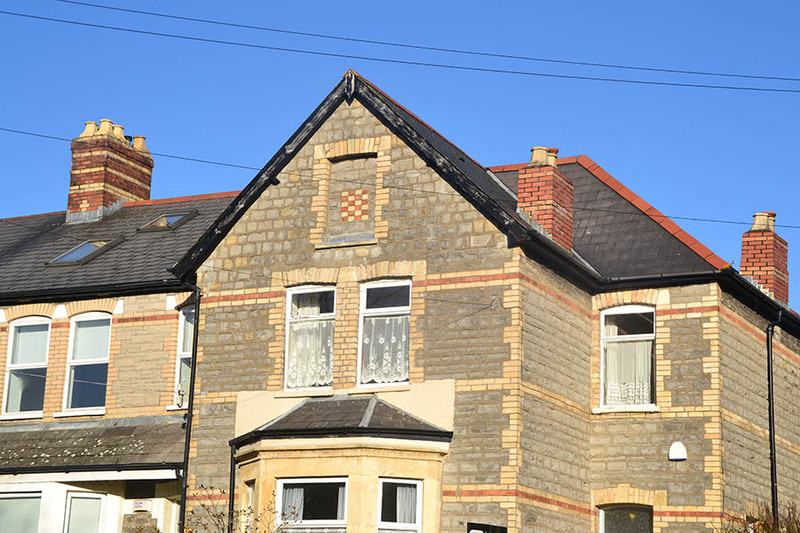 Our photographic survey (see links below) focuses on the way local builders initially used red and yellow brick as decoration for both humble terraced houses and the up-market villas of the headland. This unity continued to be reflected in building up to the Great War, although later terraces laid out as the town expanded to connect with Cogan, and the impressive semi-detached houses to the south west of the station, tended increasingly to adopt redbrick as their dominant material.